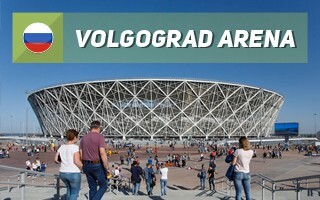 Volgograd is one of those cities, where selection of the World Cup host venue was obvious. The old Tsentralnyi Stadion already had a strong, traditional club in FK Rotor, waiting for new infrastructure. Not only that, the ground had a unique location. In the west accompanied by the Mamayev Kurgan and the Motherland Calls monument, in the east by Volga's riverside. While the site was selected early on, the stadium wasn't always expected to look like it does. 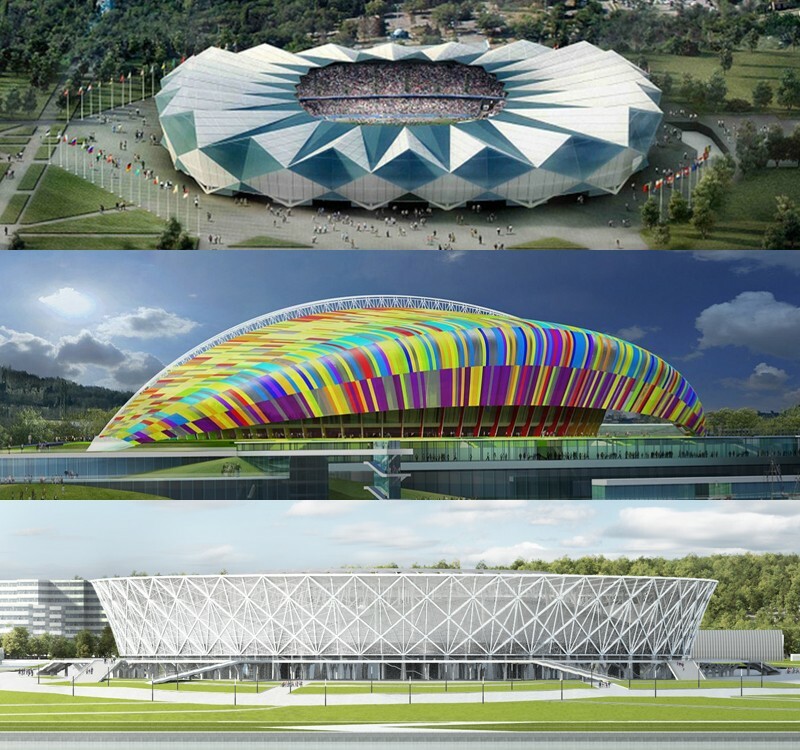 In the initial FIFA bid the Tim Hupe concept envisioned a stadium literally inspired by a rotor, celebrating the industrial traditions of Volgograd. Then the vision of Arena Pobeda was created, with one massive stand positioned towards the Kurgan, but away from Volga. Eventually a different vision won praise, initiated by GMP Architekten and best fitting the local context. Because the stadium site lies on more than one urban axis, the bulding received a circular footprint, guaranteeing a unified appearance from all sides and allowing field orientation along the north-south axis at the same time. There were three proposals for the outer wrap and one resembling wicker won. But while regular wicker is associated with rural craft, this one is modern, technological and elegant, with diamond-shaped openings providing a dynamic layout. Facades may indeed be the most interesting element of a complex spreading across 20.2 hectares. Due to spatial constraints the stadium's sin has lower circumference at ground level, which expands along with the stadium. Built piece by piece with 88 segments assembled on site (44 for lower and 44 for upper 'crown'), the structure weighs almost 5,000 tons and reaches the height of 43 meters. Only once complete, it was relieved of its temporary supports and became self-sustaining. The roof isn't resting on this steel frame, though. Instead, it's based on 44 columns hidden within the stadium. It was divided into two different structures. The outer roof, covering vast foyer around the stands, consists of diagonal trusses covered with blue and white ETFE diamonds (along Rotor's colours), while the inner roof covers the stands and is a different story altogether. The inner roof is a tensile cable structure using 12 km of steel ropes divided into 88 sections (44 upper and 44 lower). The upper and lower cables are connected with fascinating steel consoles, each 25-meter large. Altogether the cable roof weighs some 2,100 tons. In total, the stadium's cover has a stunning surface of 77,000 m2, far above average for stadia of this size. And it's no wonder, with stadium diameter of 303 meters! The height isn't modest, too. Peaking at 49.5 meters above ground, the stadium is thus some 90 meters above the waters of Volga and is considered a new landmark. Under the vast canopy there's enough room for the auditorium (31,600 m2) and a spacious foyer of 24,300 m2! The seating bowl itself is traditional, divided into two tiers with the upper ending in 'laola' wave. The main stand also offers three levels of VIP and media boxes, while the stadium was designed with roughly 460 people with limited mobility in mind. Before construction of the stadium could begin, late 2014 was focused around demolition of the old one, taking almost 2 months. During excavation a number of WWII bombs was found, holding works for a short period of time. After they were removed, construction was due to end in under 3 years, by the end of 2017. While the deadline wasn't met, delay was a slight one. Also, the stadium was delivered without significant inflation of its initial cost (RUB 17.1 billion, compared to 16.2 billion in 2014).